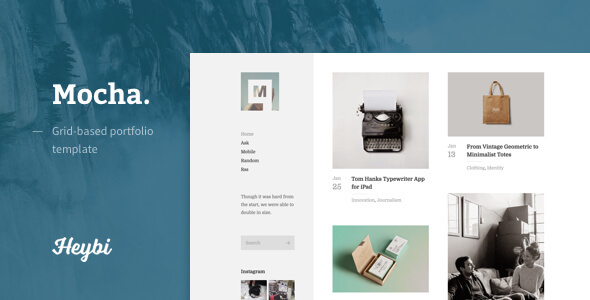 Description: Mocha: Grid-Based Portfolio Blogger Templates is a a modern, clean and professionally crafted Blogger template that has all it takes for professional photographers or hobbyists alike. It creates an enticing visual summary of your projects or photos with a dynamic grid-style homepage. Whether your showcasing portfolio or writing a visual-based journal, Mocha will fit perfectly. To enhance Blogger functionality, Mocha comes bundled with Instagram, Social link and Flickr gadgets. And by saying gadget I mean truly gadget, with interface. No code, no headache.